In the land before time – because early man hadn’t yet invented swatch watches – our knuckle-dragging ancestors lacked many things like bows, baskets, and trapper-keepers. Indeed, you may wonder how the species survived without Tupperware, pedometers and koozies, but times were even darker than that – literally. Until, that is, one momentous, undocumented moment. Now, Rio Grande sends you back in time – way back – to be a part of arguably the greatest achievement in human history: the discovery of fire! Can you lead your small tribe of cavemen to grow and prosper, being the first to patent the roaring flame? Can you do better than our distant cousins? Well, let’s hope so, considering that their IQ was smaller than the number of fingers you have on one hand. And s’mores-eaters and Kumbaya-singers throughout history will memorialize you forever more! Cavemen: The Quest for Fire is a card-drafting, tableau-building game of prehistoric inventing, with a smattering of bidding and resource management. As leader of a band of hunter-gatherers, you will recruit tribesmen, provide shelter, hunt and forage for food, and better your little clan’s lives by developing the bow & arrow, baskets, and other labor saving devices in a golden era of convenience not seen again by anyone until 1950’s housewives. You begin as a small, close-knit band with your leader, one hunter, a cave, and some food and teeth (the game’s two resources). These are laid out in your personal playing area. The starting player is determined randomly and she takes the conch token – an integral component of the game. Then a number of cards from the deck are placed face-up within reach of everyone. Cards are cavemen, beasts, caves, or inventions. On your turn you will have the opportunity to draft a card from this central pool or collect resources. While even a Neanderthal can understand the cards, they do have several icons to get used to. Cavemen are classified as hunters, thinkers, elders, or explorers. Each category is identified by a unique symbol at the top of the card. The cost in food or teeth to recruit that caveman is specified at the right. Finally, the left of the card indicates how many points that caveman adds to your tribe’s scores in hunting, inventing, foraging, and/or exploration, which also all have a distinctive icon. Beasts provide food and teeth. The right of the card states how many hunting points your tribe must possess in order to take down the creature. The left of the card stipulates how much food and teeth you collect for doing so. Caves increase your tribe’s maximum size. Your starting home is only big enough to house four cavemen. Inventions round out the card variety. These developments require certain inventing scores to acquire and then provide your tribe with permanent, special abilities or benefits. Turns are very structured and simple. After replenishing the central card pool, everyone gets a chance to bid teeth for the conch. The player with the conch gets to take two actions every round. You also must hold the conch in order to invent fire, so this phase can be an interesting one in the late game as everyone gets closer to acquiring enough inventing points to build fire. The main drawback to possessing the conch is that you must pay one food per tribe member during the next phase – feeding. Meanwhile, all others need only spend one food total. One of the starting tribes – the Wolf Clan. After feeding your people, the action phase is next. 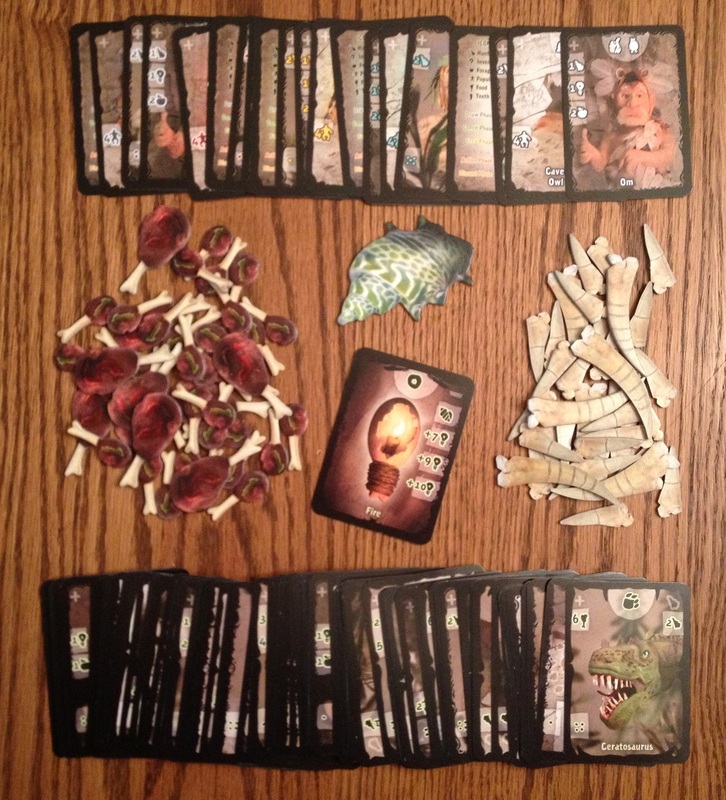 Beginning with the conch holder, each player gets one action with the potential to draft a card or collect resources by hunting or foraging. You can recruit a caveman by paying the indicated cost in food or teeth and adding her to your tribe – presuming that you have enough space in your cave(s). You can hunt a beast for food and/or teeth as long as your current hunting score allows it. Be careful though. Hunting is dangerous work and you may lose a tribe member as a casualty. A safer way to gather food is to forage simply by collecting an amount of food equal to your tribe’s combined foraging score. You can also explore to add a cave if one is available. If you have an explorer, it’s free; otherwise you’ll need to pay teeth. The final action you may perform is to invent. If there is an invention card available and you have the required aggregate inventing score, you may pick that up and add it to your tableau, benefiting from its effect when applicable. When all players have taken their action, the conch holder gets to perform one more. Then someone, usually the player to the conch-holder’s right, will discard down to three cards in the central pool and re-stock it based on the number of players. Rounds continue in this fashion until the fire card is available and the conch holder has the requisite inventing score to obtain it for the win. At that point, you may want to continue until the invention of aloe vera, silvadene, and bacitracin. Inventing fire (far left), but no burn ointments. Roaring Flame? Or Cooling Embers? There’s an old saying, “Don’t play with fire!” It can be dangerous. After all, some of history’s greatest tragedies involved fire: the Burning of Rome in 62 AD, the Great London Fire of 1666, the Great Chicago Fire of 1871, that time when Michael Jackson’s hair ignited when filming his 1984 Pepsi commercial. But as long as you can deal with the moral and ethical conundrums of the destruction you’re just about to unleash upon the world, it’s totally safe to play Cavemen: The Quest for Fire – and even fun. Perhaps the most important thing to know about Cavemen is that it’s kind of like when you throw a log on a campfire and sparks fly everywhere. It is quite random. As a card game, of course, that’s not surprising. While you can still work towards a general strategy, it is way more tactical in nature. You have to be ready to take advantage of the cards that come up, rather than wait around for one or two that you may actually desire. While the luck element can be frustrating for serious strategy gamers, it’s appropriate for this title. Namely because Cavemen is light-hearted, relaxed, and very accessible to more casual gamers. Aside from the unpredictable nature of when certain cards appear in the central pool for availability, the more impactful arbitrary element is with hunting. After taking a beast card and collecting the food and teeth, you must resolve for casualties. To do so, you simply draw the top card from the deck. All cards, other than fire, have a stone count from 1-5. If the stone count on the card you drew matches that of anyone in your tribe, you lose a caveman. It does not have to be the tribe member whose count matches the card – you may choose anyone except your starting leader. However, this luck is two-fold. Not only is casualty resolution itself completely random, but the card you drew to determine that is discarded. If it’s one of the nifty invention cards that could prove really handy, it’s now out of play until you exhaust the draw deck and have to reshuffle the discard pile to begin again. Talk about big game hunting! While Cavemen: The Quest for Fire may be random, there are still opportunities to pursue a general plan and experiment with some different combinations. The biggest contingency you must prepare for is feeding your tribe. You will frequently discover food supplies are not always in abundance. And if you can’t feed your people, one of them starves to death. Now, sometimes that’s not a bad option, despite how heartless it may sound. This is a dinosaur-eat-man world, after all. However, utilizing forced starvation as a regular practice isn’t a wise plan, as you won’t be able to accumulate enough inventing points which are required to make fire and win the game. You have two choices in acquiring food – hunting or foraging. Therefore, you can go after hunters who kill for food. Not only can you score some savory brachiosaurus baby back ribs, but you’ll often gain much needed teeth, as well. But while you can potentially earn more food through hunting, you also risk losing a tribe member during the heat of the chase. But hunters don’t contribute anything else, so instead you may want to concentrate on recruiting explorers and elders to forage. While you may not collect as much food as you can with hunting, elders and explorers provide other skills to help your society. Plus foraging is much safer – as long as you watch out for the dark red berries. Thinkers also provide an interesting decision. With an inventing score of +2, they’re very attractive options (necessities), considering you only need 7, 8, or 9 points to obtain fire (depending on the number of players). However, if you load up on too many of them – especially early on – you’ll find it difficult to get food and teeth as all of their scholarly matriculating proves of little practical benefit for day-to-day survival. Basically, they’re Neolithic liberal arts grads. Recruiting Cavemen (from left to right): Elder, Hunter, Thinker, Explorer. These choices are fun to experiment with in discovering which classes of cave people work best with others and in what ratios. That said, there are two potential issues. First, you’ll likely find yourself locking into a formulaic combination. That is, if the cards cooperate. Therefore secondly, when they do, many times there is an obvious or optimal action that you really need to take. Especially when you’re running low on food, you’ll need to hunt or forage. Overall, you can’t ignore food, so hunters will be an early priority. You have to have a least one or two thinkers to form a solid inventing base. An early explorer could prove critical to find a free cave so that you can expand the size of your little clan without spending precious teeth. Then Elders are solid late game additions to acquire food and help with inventing. Yes, there can be some slight differences and you may develop a varied preference, but you’re likely to lock in on that for most games when you find it works. Consequently, inventions bring the spice to Cavemen. These cards provide neat effects that can really boost your hunting, foraging, and inventing scores so that you don’t have to rely completely on cave people for everything. In fact, maximizing combinations of these benefits are usually the key to victory. There’s one that gives you +2 inventing if you have one of each cavemen type. Another gives you immunity from hunting casualties. Yet others give you food during the feeding phase, double the value of your teeth for bidding, and even the ability to sacrifice a tribe member for teeth! The tableau-building component really shines with the use of invention cards to accentuate not only your tribe’s current make-up, but to chain upon each other, as well. Drafting from the central pool…choose wisely. Indeed sometimes one player can do so well that the others will not be able to stop her when fire shows up in the central pool. While this kind of runaway leader issue may sound odd in a card game of this nature, it nonetheless can pop up. If someone is able to efficiently engineer their tableau with the necessary invention score, generate just enough food to avoid starvation, and gain two or more teeth every round, the endgame will be a lackluster conclusion played on autopilot. We’ve had a couple games in which the winner was obvious several rounds before the end. One player would have enough teeth, in addition to earning more every turn, to ensure he would win the conch as soon as fire appeared. Yes, that’s the goal of the game and reveals the skill (and luck) of that player, but it makes for an anti-climactic experience – and not very fun when it happens. There’s simply no way to stop a leader in such a position, nor are there any catch-up mechanisms. Other than the runaway leader element (which does not happen every session), the other characteristics mesh well together for a nice family style game. The randomness, formulaic tendencies, and lack of interaction will limit Cavemen’s replay value for more seasoned and/or serious hobby gamers. But for more casual audiences, it’s just right. Its mostly straight-forward and individual turns move quickly so that there’s little downtime. It can go a bit long for what it is with a fifth player, so I personally recommend playing with two to four. The only scaling element is with the number of cards available in the central pool, and it works fine with two, three, or four players. A tableau of prehistoric proportions. The production quality is solid, as I would expect from Rio Grande. The cards are sturdy. Unfortunately they have those black borders which tend to take, and subsequently show, wear easier. The conch, teeth, and food tokens are a nice weight. I do question the design of the food tokens, however; they are shaped like drumsticks with a protruding, skinny bone “handle.” I will be surprised if one or two aren’t broken off over the course of playing the game. By far the most striking feature of this title’s components is the unique artwork. All of the cards feature clay models that are then photographed in a mini-panorama. To save on time, each beast, cave, and caveman type have standard models and poses which are then colored and/or dressed individually to create variety. But the various inventions are all original. The result is fresh and comical, engendering a certain playfulness which only adds to its family accessibility. All in all, the game’s lower-end price point, along with the amount and quality of its components, make for a good value. 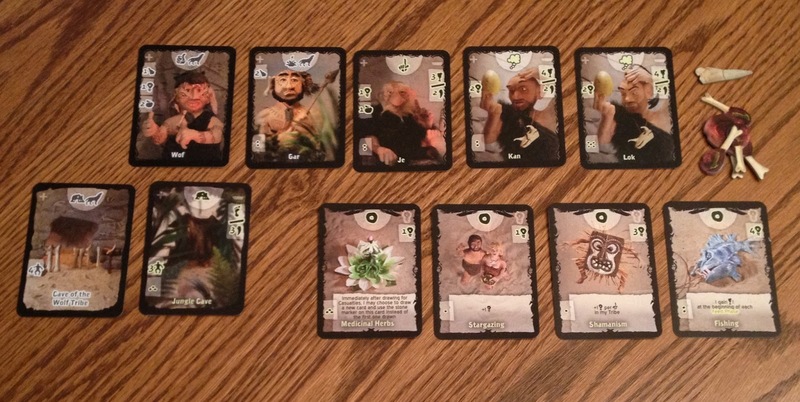 Cavemen: The Quest for Fire is a nice, family-style card game. Despite tendencies to have obvious plays, there are still opportunities to make some tough and tense decisions. Just be aware that randomness is a significant factor. While there a few ways to experiment in this title, you will likely discover an ideal strategy that works best after a few sessions. To be sure, this is not uncommon in many card games. In any event, there is some fun in the challenge to create a balance of tribesmen and inventions in which you can adequately feed your people, allow for growth, and gain “science.” Cavemen is a light, pre-historic romp that still offers choices and shines best when bringing gamers together with their families, kids, and casual friends. 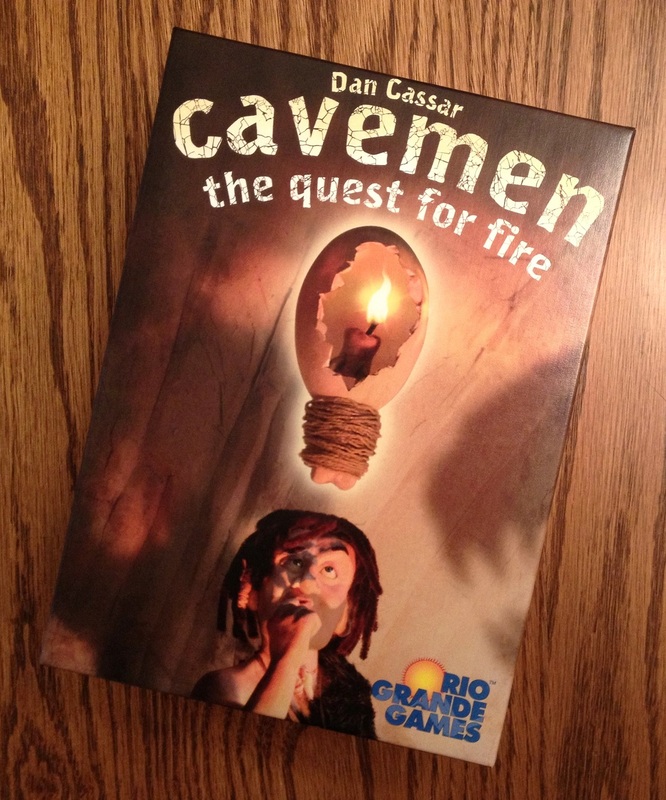 iSlaytheDragon would like to thank Rio Grande Games for providing a review copy of Cavemen: The Quest for Fire.